I've been working with Bernina on the We All Sew project since it went live at the end of last year. 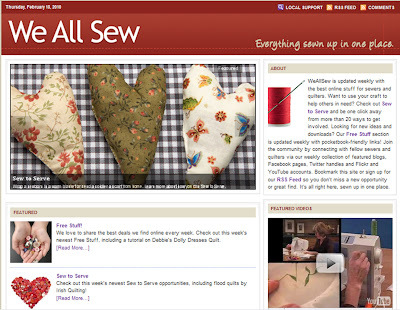 This new website is dedicated to connecting visitors to the growing sewing community on the web, posting tons of links to follow for projects, tutorials, and even others that sew on Facebook, Twitter, and YouTube. It's all about sharing knowledge, which is exactly why I wanted to be involved! My favorite part of the website is the Sew to Serve page, an ever-growing list of organizations and charities that need help from sewers like us. I love the idea of volunteering my sewing time and talents in this way, and have been looking at all the different places on the list that could use my help. I finally decided to start with sewing up some pillowcases as part of the 1 Million Pillowcase Challenge over at American Patchwork & Quilting. Go check out the details, there are even free pillowcase pattern downloads to help you get started! 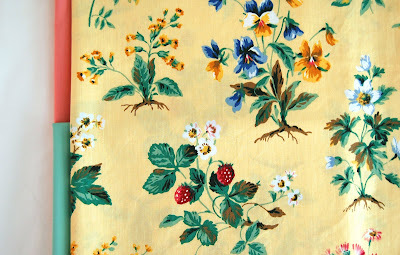 Following along with my resolution to re-use and recycle as much as possible this year, I thrifted this bright and cheery yellow flowered print to use for my first batch of pillowcases. The white will be the pillowcase band and the pink or green will be a little bit of ruffled trim (I'm using the Pillowcase with Ruffle Trim pattern from the APQ site). My crafting group is meeting this weekend and I plan to start stitching up the pillowcases then. The first two are going to my grandmother who is in an Altzhiemer's Care Unit, and I'm going to use the APQ site's suggestions for finding someplace local to donate the rest. There is a great link on the site for finding a shop near you taking donations, too! I am also challenging everyone in my craft group to make one pillowcase for charity at our next meeting, as this is a great project that ANYONE can sew up in no time! So how 'bout you? Have you found a way to give back through your sewing time and talent and do you have a favorite sewing charity? Do tell! Thanks for stopping by and for the link. It will definitely help! I look forward to checking out this site too! I love the Sewing to Serve idea. When I get more than a minute of free time I plan to check that out!